Last week neighbors in London’s East End were dismayed that a planned women’s history museum had taken an unexpected turn. Rather than “retell the story of the East End through the eyes, voices, experiences and actions of the women that shaped the East End,” the renamed Jack the Ripper Museum will narrate the lives of late 19th-century women through the familiar but hackneyed legend of a murderer. The Jack the Ripper story has been told incessantly since the murder of five women in London’s Whitechapel neighborhood in the late 1880s. The murders are a fascinating tale of extraordinary evil heightened by the murderer’s ability to remain anonymous and escape an analysis of what delivered him to such unthinkable darkness. Nevertheless, the Ripper’s story seems an especially challenging starting point to narrate the agency of women in 19th-century London. The Museum awkwardly argues that it “discusses why so many women had little choice in their lives other than to turn to prostitution”; that only seems to confirm that they will tell another theatrical tale about the Ripper instead of reflectively study the scores of women who negotiated the late 19th-century East End. 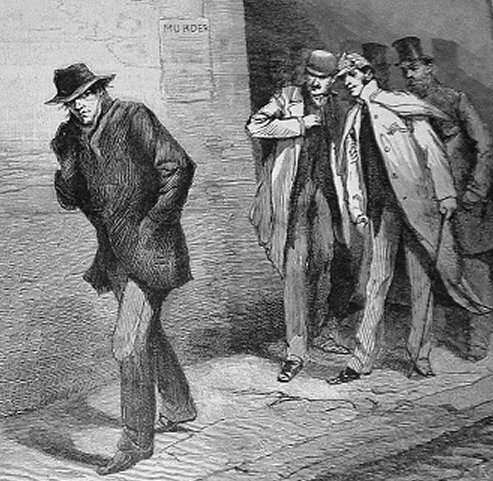 The Whitechapel murderer has been continuously constructed in popular discourses as early as this 1888 image from the Illustrated London News. The museum seems to promise a spectacular story of the East End far removed from stereotypically dry academic exposition of everyday life. A vast tourist industry clumsily attempts to preserve our fascination in the boundaries of human experience and the tragedies of history while securing the appearance of measured scholarship and escaping the charge of sensationalism. The Jack the Ripper Museum is firmly situated in this ambiguous tension between measured museum scholarship and tourist trap sensationalism. The Museum seems to aspire to present an engaging dark history even as it risks devolving into the exaggerated narrative form of movies, comic books, and popular cultural discourses. Unspeakable evil is of course a staple in popular cultural discourses, where murder, apocalypse, and serial killings are commonplace realities. However, these spectacular tellings of the real and imagined boundaries of human experience and evil normally conclude with narrative resolution that real life rarely provides. The serial killings of at least five women could perhaps provide an element in a dark history of everyday life in London, but the popular fixation on the mechanics of dismemberment and a perpetual search for the killer are not especially productive starting points. Dark histories seem especially powerful when they underscore how horrific evil becomes an evaded or ignored backdrop to everyday life, and the Whitechapel story may provide a mechanism to illuminate a host of inequalities and violence largely ignored in Ripper narratives. The Ripper’s murders were followed zealously by the world press, but few observers assessed the structural conditions that women negotiated in 19th-century London. Advocates for women were vastly out-numbered by disinterested masses, and many accounts for more than a century fail to consider these women’s standing beyond reducing them to prostitutes. The museum’s logo plays off familiar iconic images of the Ripper. Community activists Class War demonstrated at the site last week and promise to return for the museum’s opening. The 2014 planning documents for the “Museum of Women’s History” aspired to “inspire a passion for, and understanding of, the history of women in East London and beyond.” However, when its façade was unveiled last week to reveal the iconic outline of the Ripper, the museum’s original architects were among an instant chorus dismissing it as “salacious, misogynist rubbish.” The local Tower Hamlets Council conceded that “the vision of the museum was to tell the story of women of the East End of London,” indicating that the “council is aware of the Jack the Ripper imagery and is investigating the extent to which unauthorised works may have been carried out at the premises.” Local and international media have shared residents’ unhappiness with the museum’s change of mission, and the grassroots group Class War picketed the site last week and plan to return this week (compare Bustle’s review of tweets attacking the museum). The Museum’s doors open this week, so its concrete narrative presentation remains unexamined, but it is not especially promising that they advertise an opportunity to tour “the morgue and see the autopsy photos and reports of the murdered women.” The Ripper’s popular narration is a hyperbolic but familiar narrative illuminating a variety of insecurities about women in public space and the potential evil masked among the masses. The Ripper’s tale may have seemed magnetic to the planners, providing them a familiar historical tale in which a real historical figure and his exaggerated popular interpretations have merged into a pseudo-historical character. That story hazards saying nothing about the women living in late 19th-century London as agents directing their own lives, and it risks failing to address the men’s violence against women that has so often been an uneasy backdrop to everyday life. 2001 Jack the Ripper and the London Press. Yale University Press, New Haven, Connecticut. 2013 Dark Tourism Scholarship: a critical review. International Journal of Culture, Tourism and Hospitality Research 7(3): 307-318. 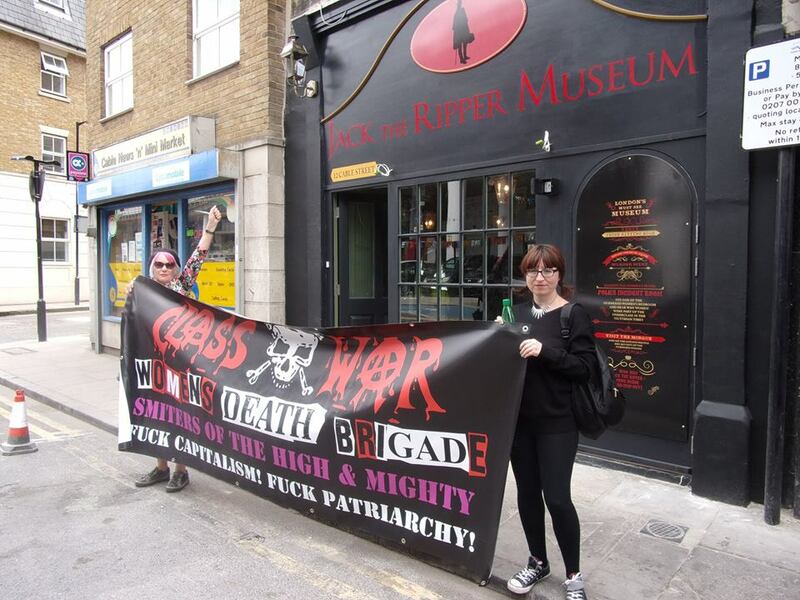 Class War Demonstration at Jack the Ripper Museum image from Class War facebook page. Illustrated London News 1888 image “With the Vigilance Committee in the East End” from wikimedia commons. 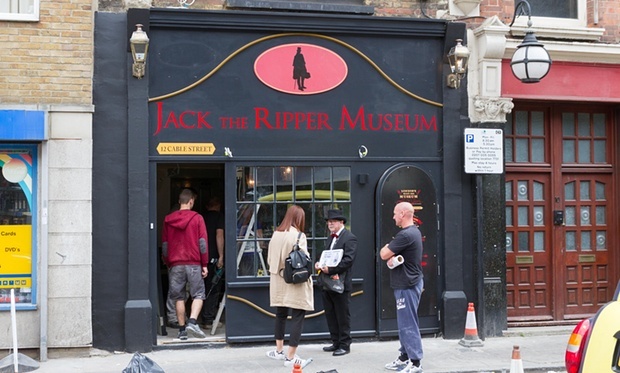 Jack the Ripper Museum facade image from The Guardian. Jack the Ripper Museum logo from Jack the Ripper Museum web page. Posted on August 2, 2015, in Uncategorized and tagged #WPLongform, Jack the Ripper, London, museums. Bookmark the permalink. 7 Comments. There absolutely is good material in the lives of the murderer’s victims for a telling of the stories of women of that place in the East End, in large part because, as core elements of “Ripperology,” their lives have been exhaustively researched. There’s good material there for explaining all sorts of things about that time and place. But that’s not what the museum organizers are doing; they simply cashing in on violent, mysterious death. More macabre gossipery (patent pending) for those loving tawdry tales. Never mind the history, treat women like cattle, forget classism. Never a dull moment in this system. Boo. Trying to tell the story of women through the story of one man, on the basis that he is the most influential person in the area…sort of missed the original point of the museum there. The Ripper narrative obviously serves to devalue, objectify, and subjugate women and working class women in particular. The persistent, pervasive power of this narrative is disturbingly reactionary. Then to sensationalize the suffering of the Ripper’s victims as apparently is being done is appalling, at best. However, no one has ever lost money underestimating the tastes of the public. While I can understand the desire to feed the whims of the public, oftentimes the public doesn’t know what it’s missing; hence the need for cultural institutions. I hope someone will pick-up the idea of a women’s history museum and move forward in making it a reality.